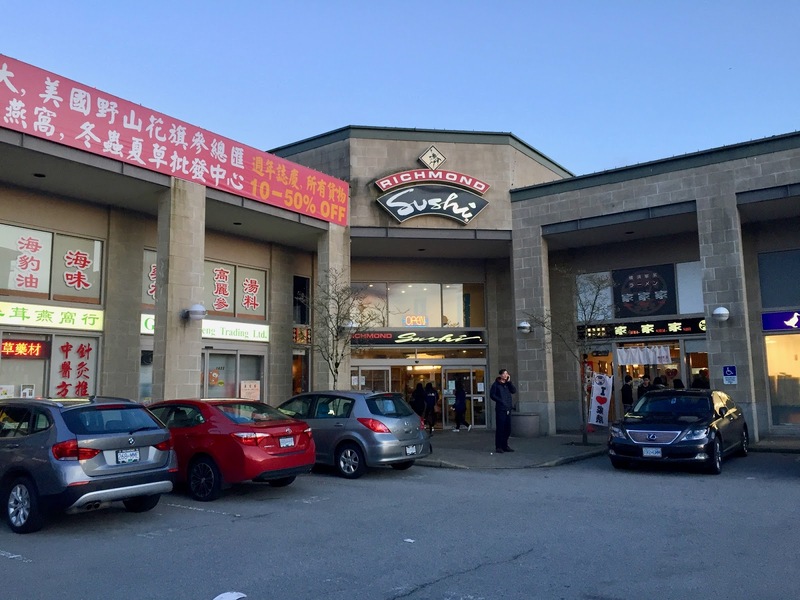 My first experience with Richmond Sushi was when Patrick invited me and 16 of his other friends to a huge all-you-can-eat (AYCE) dinner. The main objective of the dinner was to have a showdown between Patrick and I to see who could eat more. Needless to say, with all the socializing and record-keeping going on, the environment was not very conducive for blogging. However, after dying from the amount of food I ate at the dinner, I decided that dying just once wasn't manly enough, so I went back, the very next day, to try as many items as I could and die a second time. 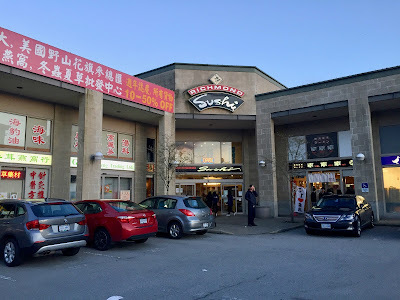 Richmond Sushi is a very large but busy Japanese restaurant located in Union Square (slightly north of Aberdeen Centre). 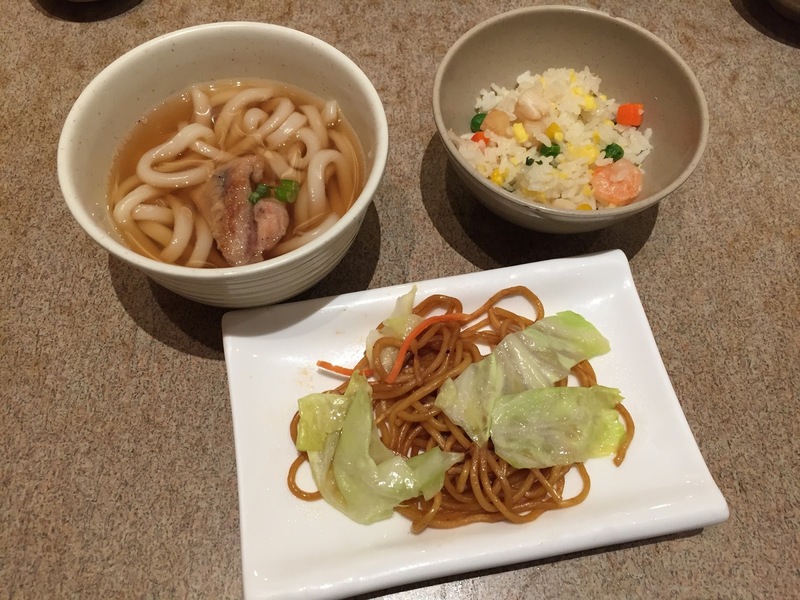 It is said to be one of the best Japanese AYCE restaurants in Greater Vancouver. Their menu is extensive compared to other Japanese AYCE restaurants. 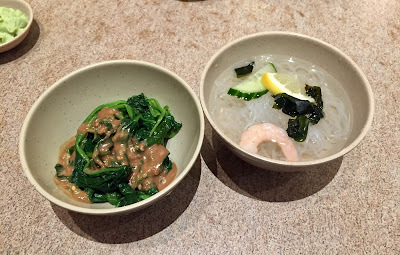 As such, they have a slightly higher price point ($26.95 for the regular dinner menu), though not as high as Shabusen and Kyo, which also serve Korean BBQ. To maximize the number of items I could try, I went for the deluxe AYCE dinner ($37.95). To start my meal healthily with some veggies, I went for the Gomaae and the Ebi Sunomono. The Gomaae came with thick peanut sauce, which I thought could've been more evenly spread. A light touch of savouriness was mixed in with the sweetness. The Ebi Sunomono was strong and acidic and came with a single somewhat sweet shrimp. 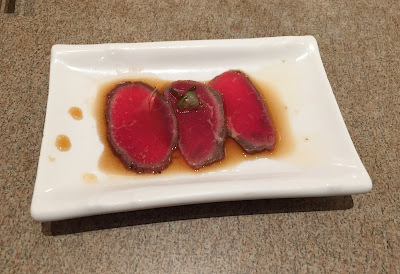 The Beef Tataki was cut into super thin slices and dressed in ponzu sauce. The beef had little flavour, which was drowned out by the ponzu sauce. 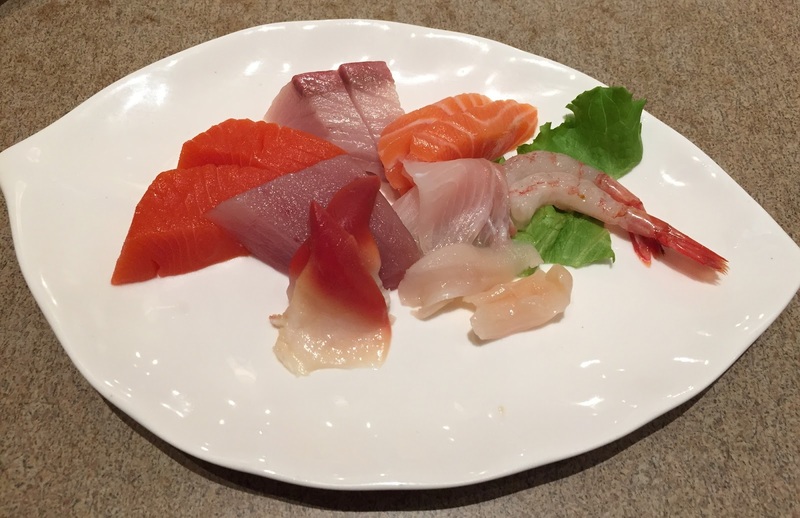 There was a consistently moderate level of freshness across the sashimi. The best piece in my little sashimi platter was the hamachi, which was smooth, very soft, and not fishy. 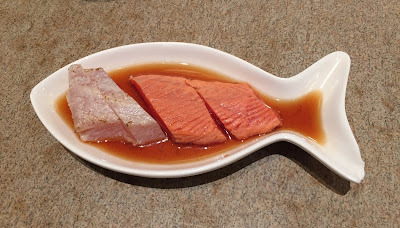 However, the tuna itself was slightly fishy and cut a little too thick, while the hokkigai lacked flavour. The Atlantic salmon was soft and marbly, though also a bit weak in flavour. The light ponzu sauce used to accompany the tataki did not overwhelm it. I enjoyed the soft textures of the fish, although there was a lack of seared flavour. The bean curd in the Inari Nigiri was delectably sweet, with sufficient moisture inside the bean curd pocket. For the other pieces of nigiri, the rice was quite sticky and packed a little too tightly. The Atlantic salmon here had the same pleasant marbly texture as the Atlantic Salmon Sashimi above. 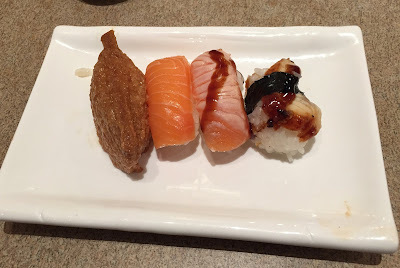 The Torched Salmon Nigiri lacked a torched flavour, while with the Unagi Nigiri, there was way too much rice given the amount of unagi provided. Going along with the tradition of turning every imaginable food into sushi, Richmond Sushi serves an assortment of sushi sundaes. If you've ever wondered what a sushi roll would taste like with 10 times the usual amount of filling, this is it. The results were not disappointing. 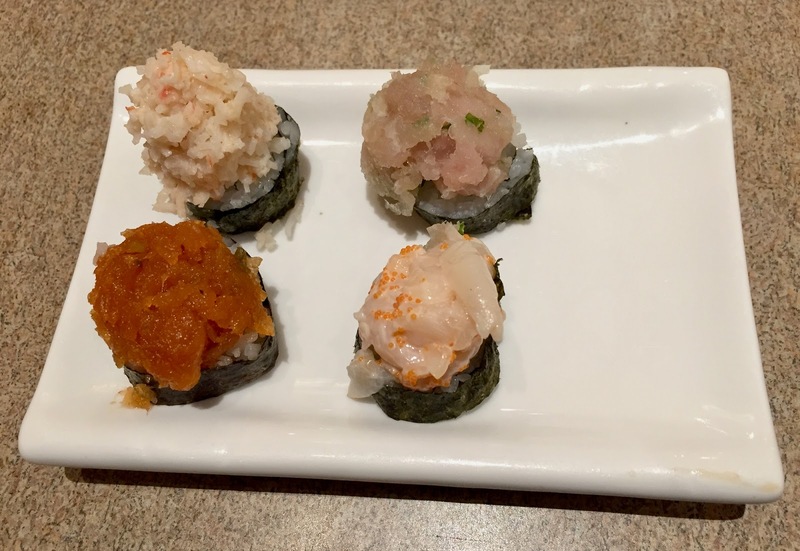 The sweet imitation lobster in the Lobster Delight was delightfully creamy and soft and was a good complement to the kappa roll at the bottom. The Tuna Chop Chop and the Scallop Pearl were slightly weak in flavour, while the XO Tuna was quite spicy. 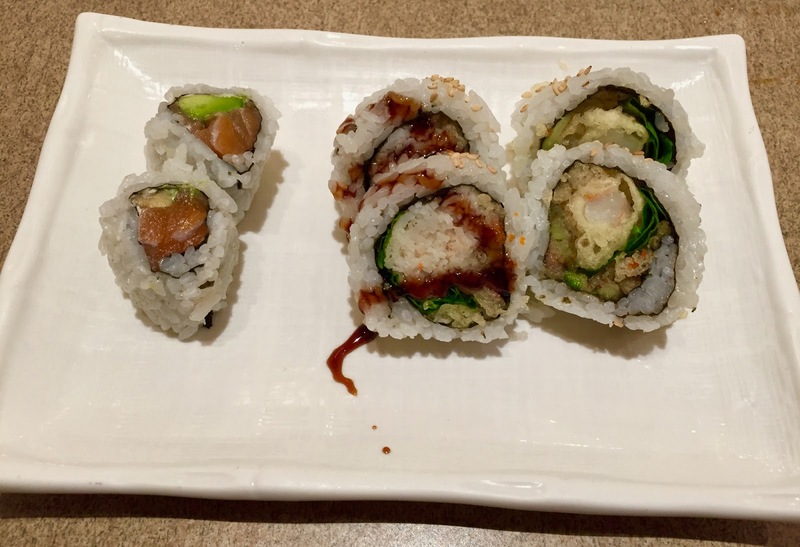 The Salmon Avocado Roll came with cream cheese and resembled a Philadelphia roll. The creamy textures of the salmon, the avocado, and the cream cheese worked together. The Top Gun Roll (lettuce, cucumber, tempura bits, imitation crab) was also decent. Enhanced by a light drizzle of teriyaki sauce, the crunchy textures of the lettuce and tempura bits were a good contrast to the softer, sweeter imitation crab. The Dynamite Roll was sloppily constructed and a tad dry. The tempura generally exhibited good moisture preservation. However, some sauce or seasoning would've been nice for the Salmon Tempura, which tasted rather plain. The Prawn Tempura was wonderfully crispy and juicy. 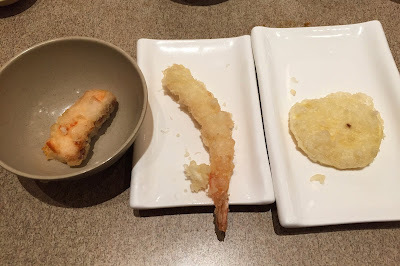 Interestingly, the Prawn Tempura was an entire letter grade better than the Prawn Tempura I had with Patrick the previous night (does bringing a notebook help?). The Yam Tempura was slightly greasy, but the thinly sliced yam was deliciously sweet. Continuing down the fried region of the menu, the Spring Roll was crunchy, though the filling was nearly identical to that of a Chinese dumpling. The Deep Fried Shrimp Bomb was indeed bomb, and the sweet chili sauce brought it to life. The bombs lose their crispiness quite quickly, so it is wise to consume them quickly. 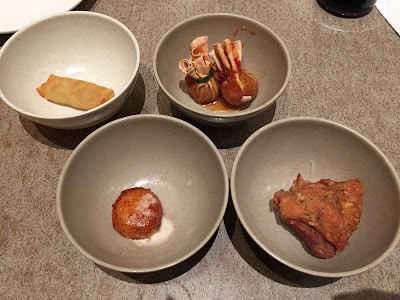 The Fried Scallop contained sufficient moisture, but much of the sweetness of the scallop was lost in the frying process. The Chicken Karaage was juicy and garnished with an appropriate amount of spices. The Black Cod was sweet with a gingery touch, though it could've been a little softer with more of a grilled flavour. The random bit of cod on top was an interesting garnish. 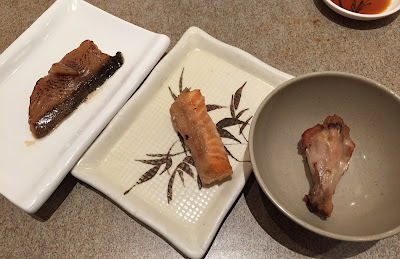 The Salmon Belly reminded me of BBQ Salmon Kama—creamy and juicy with a delicious smoked flavour. The Chicken Drumstick was quite standard fare. It was sufficiently moist, but slightly plain. One common mistake seen in many Japanese AYCE restaurants is overcooking the grilled food. 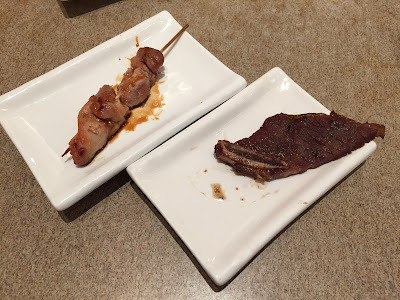 Here, both the Chicken Brochette and the Beef Short Rib were overcooked and ended up quite chewy. However, the Beef Short Rib had a decent smoky flavour. 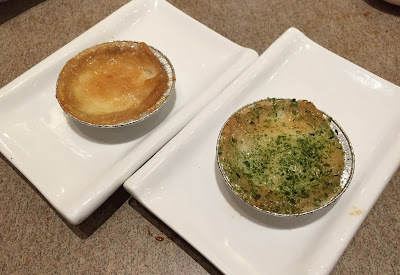 The oyster in the Oyster Motoyaki was quite juicy, but the mayonnaise was quite heavy. The motoyaki ended up very oily in general. The Seafood Motoyaki consisted of mainly salmon (chopped and soft in texture) and ebi. The herbs sprinkled on top alleviate the heavy feel of the motoyaki somewhat. The Flaming Lava Chicken was dressed in ketchup and turned out a lot less spicy than expected. The chicken meat could've been smoother in texture. 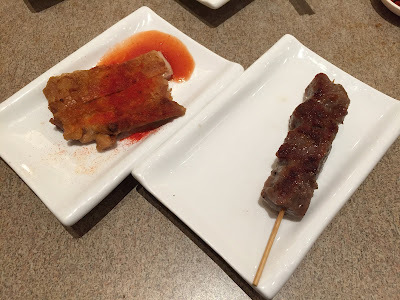 The New York Steak on Skewer was lightly spiced, and despite its thick appearance, it wasn't too tough to chew. After trying the 40 items above, it was time to conclude my feast in style with 3 fillers. Unfortunately, the fillers were not very well-prepared, which made the task of finishing them all the more challenging. In the Chicken Udon, the noodles were too soft, and the chicken was slightly soggy. The Seafood Fried Rice tasted more like Bland Sticky Rice, and the scallops and shrimp were overdone. The Vegetable Yakisoba was dry and also tasted dreadfully plain. The one saving grace here was that all of the fillers came in small, manageable portions. 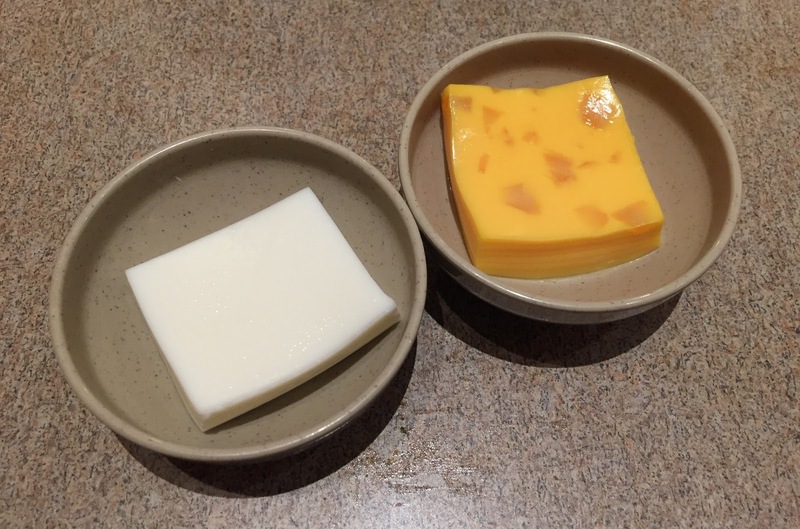 Finally, the pudding came in neat, square-shaped cuts. The Coconut Pudding had a pleasantly sweet flavour, though it felt slightly powdery around the edges. The Mango Pudding was the better tasting of the two, with an easily discernible mango flavour. Despite the appearance of bits of jelly inside, the "jelly" had exactly the same texture as the pudding itself. I enjoyed friendly, timely service during my visit, although during my dinner with Patrick, it was apparent that tables that order large quantities receive less service. This was not preventable given the number of people we had. Overall, I found the food generally above the standard for Japanese AYCE restaurants in Vancouver. Although the food was not exactly first-class, Richmond Sushi is one of the restaurants I would recommend if you must have AYCE sushi in Greater Vancouver.